A tag cloud is simple but a visual representation of a text data. It is mainly used to depict key work tags on the internet. Tag cloud tools help us to create infographics to visualize the point that we are trying to convey or the message that we wish to deliver. For example, we could create infographics to envision the idea or message which we are working to address. The following are the best online tag clouds, creator. TagCrowd is a website which allows us to create a tag cloud from plain text, link or a text file which contains the words to mention in the tag cloud. It’s very simple to use; We have just to enter the words or texts that we are willing to visualize in a tag cloud fashion and configure the settings. Then “Visualise” button should be clicked, and we could see the magic. One can also search the most used words from a website. It is performed by entering the website link in the URL bar, and that brings the tag cloud for that site with the most visited or searched words, and the least visited/explored. Wordle is an online tag cloud manager which helps its users to create word clouds or tag clouds in quite different fashion and layout which makes it stand out in the crowd. Just like TagCrowd, we can create a tag cloud based on plain text, URL link or even some username. One can build and customize our tag cloud fast with ease. Set the language preferences and filters. We can select our desired font. Set the layout and color palette for personalization. ToCloud is an online website which allows visual representation of some text as a bunch of words based on their weight associated with each word. Using ToCloud on a blog, or a website will allow users who can easily find about topics that are being discussed. We can just enter the link to the blog/news page to locate the tag clouds for that website. One can also enter the text we want to visualize in the tag clouds. It is possible even to enter some “Stop Words” just to filter out words that we do not want to be visible on the tag cloud like abusive and offensive words. 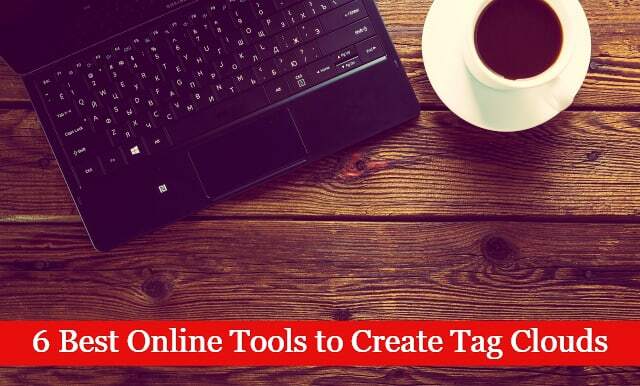 It's a website that allows you to create tag clouds in a creative way. It is actually a multi-feature tag cloud generator which allows the users to build beautiful clouds and embed them on their own blogs. You need to create an account on Tagul at the first place. Only after doing that one can enter the words or choose a website for which he wants the tag clouds that we are interested in generating. We can name our cloud. To get some tags, One can copy and paste the source code or simply the URL link of the tag. There are the predefined shape (cloud, heart, star, triangle, pentagram, circle, rectangle) and specify the form angle and aspect ratio as we wish. Tagxedo is another online website on our list that comes with an easy to use layout for tag clouds to be created. However, it’s unique because it allows us to build tag clouds from even just URL links and simple plain text. Tagxedo also makes it possible to build tag clouds from Twitter ID, Del.icio.us and similar websites. It creates typography artworks. We can change the shape if you want to arrange the tag-cloud in our desired way or it can also be chosen to be in the classic shape which will be in the usual way. And it’s also possible to edit it later. Then we can save the tag cloud in an image format or print format or for the web if you want to transfer it to our website or blog. It offers a huge variety of fonts, themes, color palettes, etc. The results can be embedded using the iFrame. And it can be saved in the gallery with the link to the live tag cloud. It is one of the simplest tag cloud or word cloud tool. ABCya is specially designed for school kids. To define word cloud, it is a graphical representation of the word frequency. You can quickly paste or type text into a box on the home page and then press arrow button to view the generated word cloud. The cloud can also be altered utilizing the graphical buttons which are the main features of ABCya. Saving and printing the word or tag clouds by just a simple click is made possible in ABCya.